Back in February, we showed you some leaked pics from iResQ that were supposedly pictures of the next-gen iPhone's front face. Now, SmartPhone Medic, another iPhone repair outfit, has released pictures and video of what appears to be almost the exact same next-gen iPhone faceplate that iResQ showed off. SmartPhone Medic's video shows a bubble-wrapped part being removed from packaging labelled as "OEM 4G LCD & DIGITIZER," along with some other lettering that I can't quite make out, which either says "IPB," "IPS," or possibly something else entirely. Like the faceplate iResQ revealed in February, this faceplate is approximately 1/4 of an inch longer than the faceplate from the current iPhone 3GS, but SmartPhone Medic's video makes it much clearer where this extra 1/4 inch is coming from. The display dimensions on the "4G" LCD are exactly the same as those on the 3GS, and the upper portion of the faceplate, where the headphone jack, proximity and ambient light sensors, and top speaker are all housed, is almost exactly the same size. The bottom of the unit accounts for almost all of the extra space -- notably, this is where the current iPhone 3GS's primary antenna is housed, near the dock connector. It's widely expected that the next iPhone will have an 802.11n antenna, so perhaps this accounts for the need to lengthen the iPhone's antenna section. This faceplate from SmartPhone Medic differs from the one iResQ showed off in one very important way. While the faceplate from iResQ had no obvious new holes in it, the SmartPhone Medic faceplate has a small hole next to the top speaker, in approximately the same location as the current iPhone's proximity and ambient light sensors. Since those sensors are perfectly capable of operating through the iPhone's display glass, as any possible indicator lights would be, the most plausible reason for this hole's existence is a new piece of hardware in the iPhone -- quite possibly a front-facing camera. One other thing was made pretty clear in the video: something is different about the display itself. Read on to find out what else has changed. There's an obvious color difference between the 3GS display (on the left in the picture below) and the "4G" display. 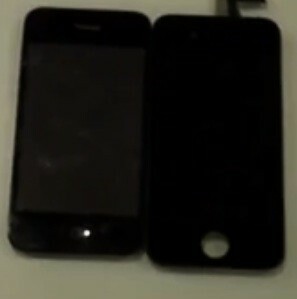 The 3GS display looks almost grey, while the "4G" display is much darker, nearly black. It's worth noting that this is the same way the iPad looks when it's turned off, which suggests the "4G" display may be using the same IPS technology, allowing the display to be viewed from virtually any angle without any color shifting. As always, it's entirely possible that this "leaked" display isn't the genuine article, but I'm a little more convinced of its plausibility after seeing video in addition to photos. What do you think? Is this the face of the next iPhone? View the YouTube video from SmartPhone Medic below and judge for yourselves.